Box traps are one of the most effective methods for trapping raccoons in urban and suburban areas. Raccoons are relatively easy to catch in traps. A cage or box trap should be used in populated areas or if you have free-ranging pets in your neighborhood. Use a well-built trap that is at least 10-inches by 12-inches by 32-inches. Place the trap on a level area and make certain the area around it is free of items that a raccoon might grasp and pull to the trap. When placing cage traps on roof tops, a protective piece of plywood or similar barrier that extends approximately one-foot out on all sides is necessary to protect shingles from being torn. Prevent baited cage traps from being rolled over by anchoring them with stakes. Secure traps set in other locations with strapping metal or other anchors to prevent sliding off roofs, etc. Bait the traps with sweet fruit (e.g., cherries or grapes), marshmallows or jelly to reduce the chance of catching non-target animals. Place a pile of bait behind the trigger and scatter a little bait outside the opening of the trap and just inside the trap entrance. 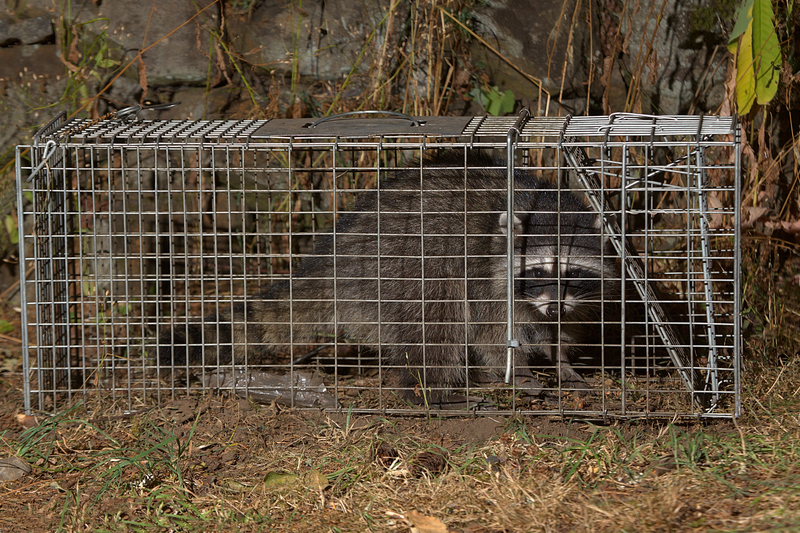 Make sure the back of the trap is screened with ½-inch mesh or smaller to prevent raccoons from reaching the bait without entering the trap. Because raccoons often carry rabies, they should not be relocated when live-trapped. Some states do not allow relocation. Raccoons should be released on your property following repair of openings, but the potential for recurring damage and for conflicts with other landowners should also be considered when making this decision. If releasing the raccoon nearby is not an option, humanely euthanize it with .22-caliber rifle or pistol, or by placing it in a carbon dioxide chamber. If the raccoon is going to be tested for rabies, then do not shoot it in the head. Note: Discharging firearms in developed areas is often prohibited by local safety ordinances and state hunting laws. For assistance in the control of problem raccoons, contact a licensed wildlife control operator in your area. Hunting and trapping during established, regulated seasons can be effective in removing nuisance individuals and lowering the local population. Call USDA Wildlife Services at (603) 223-6832 for advice on dealing with nuisance animals. Their trained staff will guide you to a workable solution. If Wildlife Services is not able to resolve your problem, they can refer you to a licensed Wildlife Control Operator (WCO) who can resolve the problem for a fee. Some WCOs will pick up trapped animals for a fee. Make arrangements in advance – BEFORE you set a trap. The NH Fish and Game Department does not lend out traps due to the potential for injury from bites, scratches, and disease exposure. NH Fish and Game personnel are not generally available to relocate or remove trapped animals. Responsibility for the transport and release of trapped animals falls to the person who sets the trap. Note that the potential for the inadvertent capture of a skunk is high and that handling skunks requires special skills and an action plan. Individuals handling or transporting wildlife should take precautions to avoid potential disease exposure. For safety reasons and to avoid spreading a disease to a new area, sick animals should not be transported. Do not physically handle a trapped animal or expose yourself to animal bodily fluids, including saliva; this can expose you to wildlife diseases such as rabies. Consider where you place the cage. During summer months, traps should be placed in shaded areas to avoid overheating. During winter months, traps should be protected from wind, snow and excessive low temperatures. Do not leave an animal confined in a cage trap, especially if exposed to heat or cold. To sum things up, if you are experiencing problems with nuisance wildlife, make sure you have a plan before you employ a cage trap. Know the answer to this question: What am I going to do with this animal if I trap it and how am I going to do it?